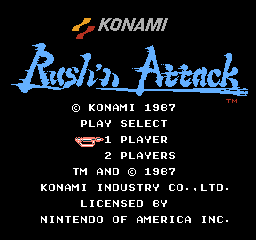 Rush'n Attack is a conversion of the arcade classic but features two additional stages, a two players simultaneous mode and a catchy soundtrack. "Let's Go Ben!" "Ok Steve!" 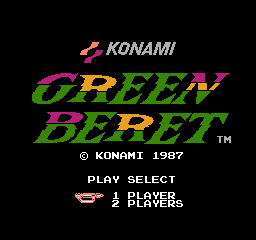 Although the Japanese Famicom Disk System version is roughly the same as the NES version, there are a few differences. 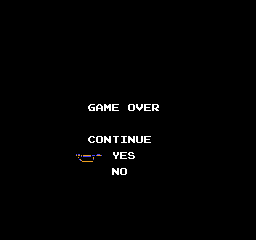 The Japanese version allows the player to continue up to three times after a game over. The international versions lack continues and repositioned the text slightly. 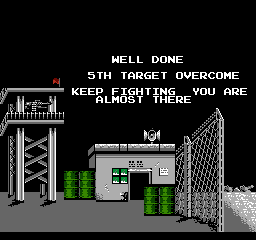 The North American version introduced a glitch where part of the score digit 5 sometimes turn grey. 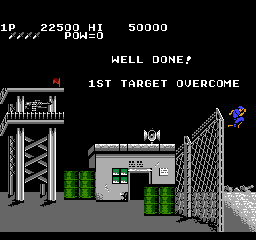 If you destroy some of the landmines in stages 2, 4 and 5, a few ladders will be revealed, which leads to a secret tunnel area. In the tunnel, you will encounter all standard enemies as well as supply runners and landmines. In order to get back to the ground level, you must use one of the ladders on the upper floor. 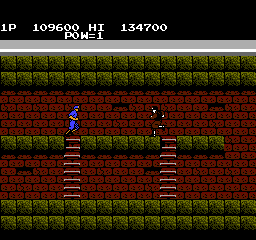 Each exit ladder leads you to a random location of the same stage. 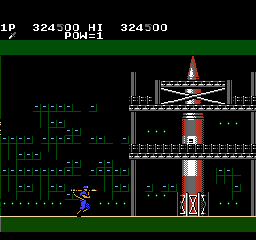 These tunnels were removed in the international versions. The text in the intro was cleaned up and some additional graphic details were added to the background. 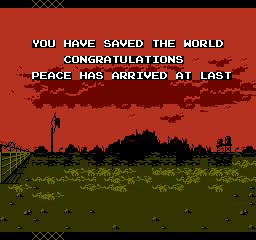 The Japanese version doesn't feature the stats in the stage clear cutscenes. 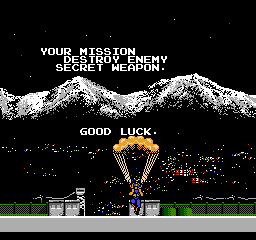 Also, the text and the animation of the flag were touched up as well. Once again, the text was revised with punctuation and exclamation marks. 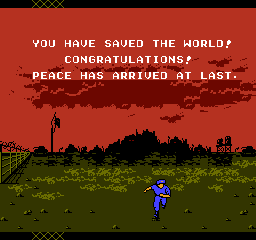 The ending cutscene also freeze-frame your character(s) in the international versions and uses the sky background palette as the background for writing its text. 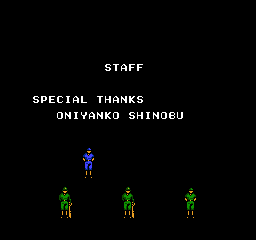 The special thanks credit was altered between versions. Additionally, the green-clad soldiers were repositioned. As per FDS standard, there is loading time between stages. 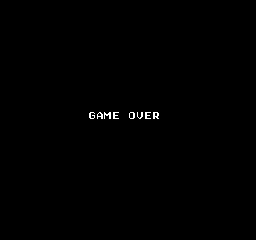 You will need to switch to side B before the title screen, and back to side A before the final stage. 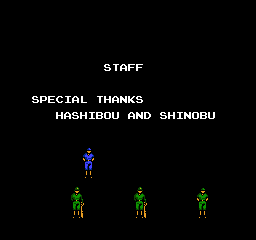 In the Japanese version, you start with three lives instead of five. If you lose a life, you will respawn at the very spot where you died instead of being sent to the last checkpoint (in the international versions, instant respawns are only allowed in 2-players mode). Each secondary weapon you pick up only adds one use to your arsenal instead of three. 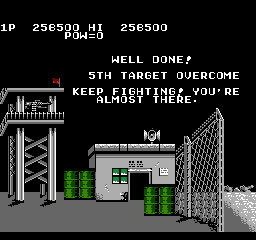 However, there are more supply runners, and you can carry a maximum of nine rounds instead of three and keep your weapon between stages. At the secret weapon on the last stage, enemies rushes in from both sides of the screen instead of just the right side, making this part much more difficult. 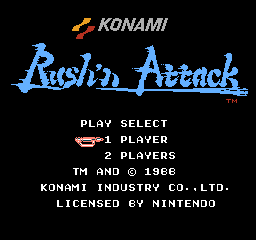 Also only in the Japanese version, hold A+B+Down on controller 2 and one of the below buttons (corresponding to the desired level) on controller 1 at the title screen, then press Start to go to the desired level. This page was last modified on 15 February 2018, at 20:13.